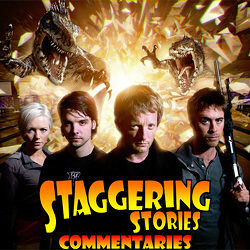 Adam J Purcell, Andy Simpkins and Keith Dunn sit down, Cuttered, in front of ITV’s Primeval Series 1, Episode 2, and spout our usual nonsense! Welcome to the thirteenth Doctor Who Podcast Alliance episode. This podcast features an interview with Dan Freeman, writer, producer and director of the new Minister of Chance web audio series and previously the director and co-writer of Death Comes to Time. This podcast has been kindly organised, conducted and donated to the DWPA by Dr. Phill (Phillip W. Serna) of the Adventures in Time, Space and Music podcast. 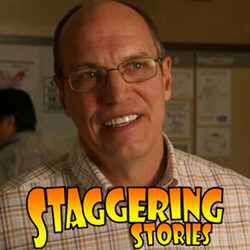 Staggering Stories Podcast #113: Burn, Baby, Burn! 02:30 — Doctor Who: Let’s Kill Hitler on the 27th of August 2011. 08:44 — Hong Kong Phooey: Eddie Murphy takes on Penry. 11:35 — Ianto Jones: Guest starred on Warehouse 13. 13:03 — Doctor Who: DWM spoiling it again? 17:48 – Doctor Who: Spoiler-free general impressions of Let’s Kill Hitler. 27:03 – Torchwood: Miracle Day episodes 3 and 4. 47:47 – Harry Potter and the Deathly Hallows Part Two. 91:01 – Whooverville 3: Join us on the 3rd of September in Derby, UK. 91:35 – Farewell for this podcast! 92:07 — End theme, disclaimer, copyright, etc. Wikipedia: Harry Potter and the Deathly Hallows (film). The Whoovers Doctor Who Group. Facebook: Whooverville 3 Event Page. Mister M’s Feedback Link: Mister M’s Facebook Profile. Adam J Purcell, Andy Simpkins and Keith Dunn sit down, reapered, in front of the 2005 Doctor Who episode, Father’s Day, and spout our usual nonsense! BBC: Doctor Who – Father’s Day. 02:04 — Karen Gillan: Treading the boards, a new film and maybe back for S7? 06:00 — Doctor Who: New Adventure Game – The Gunpowder Plot. 07:59 — Torchwood: Starz aren’t jumping to make more. 11:34 — The Tripods: Film version in the works? 13:59 – Torchwood: Miracle Day episodes 3 and 4. 83:39 – Farewell for this podcast! 84:09 — End theme, disclaimer, copyright, etc. BBC: Doctor Who – The Adventure Games. Sarah’s feedback link: YouTube – Say Hello (A Doctor/TARDIS Trock Song).